Here’s your chance to save 64% on SanDisk’s massive 400GB microSD card. With the price down to just $83.99, now’s the time to expand on your phone, tablet, camera or console’s storage without giving it a second thought. It doesn’t matter whether you are a professional videographer, or an amateur photographer. You could even just be a heavy Nintendo Switch gamer. No matter the bucket you fall into, you’re likely always on the lookout for a great deal on a microSD card because, if you’re anything like us, you just never quite seem to have enough space on the cards that you are using right now. Thankfully, there are great deals cropping up everywhere, and today is no exception. 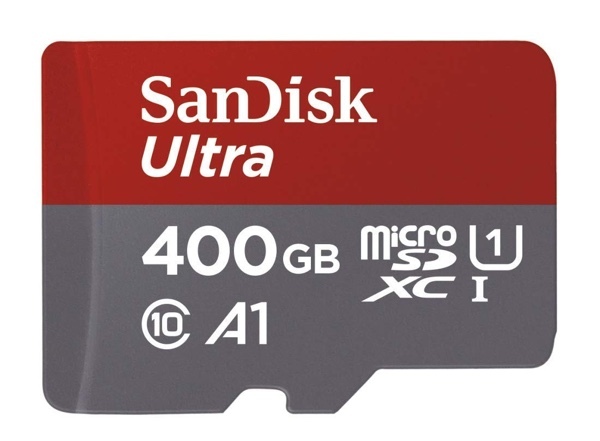 On offer today is SanDisk’s 400GB card. A card that carries the Ultra brand, this not only has globs of space to offer but is also pretty quick, too. It’s a Class 10 card, which means it is perfect for use with devices that want to record 1080p video as quick as possible, and the A1 rating also makes it ideal for use in phones, too. No more waiting around while apps load because your microSD card is sub-par! All of this is great even before we get to the deal, but right now this SanDisk Ultra 400GB microSD card can be yours for just $83.99! Whether you’re going to use this card to record high-end weddings or just need it to give Mario Kart a little more room to breathe, we’re sure that you won’t regret picking this up. It’s a great card at a great price, and it even ships with a full 10-year warranty direct from SanDisk. What’s not to love?